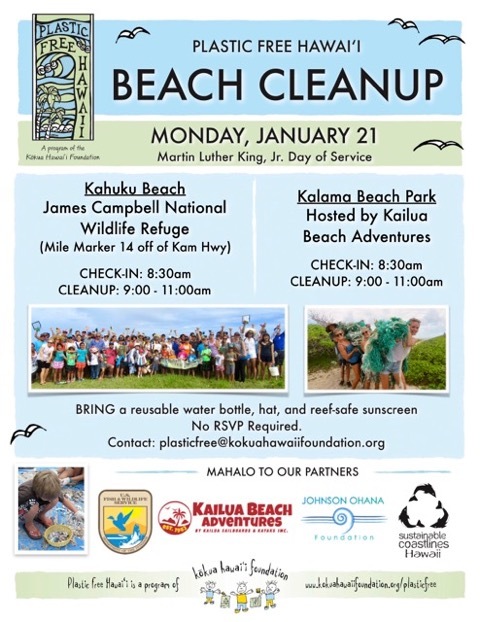 Our next beach cleanup is on Monday, January 21 for Martin Luther King, Jr. Day of Service at Kahuku & Kalama beaches. The Kahuku cleanup will be at James Campbell National Wildlife Refuge, enter through the gate off Kamehameha Hwy at Mile Marker 14 and follow banners to the beach (or use this Google maps link). The Kalama Beach Cleanup is co-hosted by our friends at Kailua Beach Adventures. Bring a reusable water bottle and reef-safe sun protection. Light snacks offered for volunteers. No RSVP necessary unless you are bringing a large group. More details here. E-mail [email protected] with any questions. Mahalo to Sustainable Coastlines Hawaiʻi for supporting our efforts to recycle what we clean off the beach through the Parley for the Oceans program!